I am a sponge, ready to absorb what Capcom has to throw at my pleasure nodes. There was pleasure found during my time on Monster Hunter 4 Ultimate, and also some pain. I own a 2DS. I do not own the add-on thumb-stick, or have plans to purchase the LL 3DS systems. I like the layout and feel of the 2DS, so I’d purchase a 2DS XL. Yet, Monster Hunter 4 Ultimate isn’t made for those of us who haven’t adopted the add-on stick or LL 3DS. Yes it runs on our machines, though it is limited. Because the camera is designed for dual-stick approach, it adds a level of frustration to the whole experience. You are forced to either remove your thumb from the left stick to pan the camera around with the D-pad, or, more frustratingly, you can use the touch screen to turn the camera. Using the touch screen provides a new set of issues; you can’t attack at the same time. Suddenly Capcom have released Monster Roamer. Also, it could just be me, but I was unable to find any sort of lock-on system in general. But, it’s not all bad. No, sir. The graphics are some of the better on Nintendo’s handheld; lighting works really well when moving past mountain ridges, entering new zones over a vista, or exiting from a cave. I had no stuttering, slowdown or other such annoyances. I was pleasantly surprised by the level of detail in parts of the game and the weapon models are the standout items here. In battle, combat felt responsive and fluid. It’s a rather simple system on the surface, akin to titles in the Zelda franchise. Jump, attack, strong attack, potion. Yet, it can get rather deep and complex. Weapons, weapons everywhere. I tried my hand at a handful of weapons; a lot felt as you’d imagine. Huge, Excalibur-esque swords will leave the monsters wishing they’d never left their nest. Axes cleave away, but felt less impactful. Then there is the Insect Glaive weapon archetype. This weapon, my giddy aunt, is made for a gamer like myself. It has multi-target lock-on mechanics, basically a ranged cleaver. 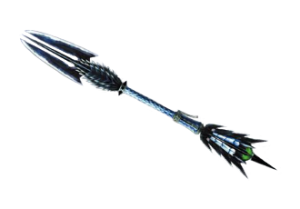 The glaive didn’t feel as impactful as the sword type, yet it was nimble and allowed for more fast-paced combat. Weapons in MH4U feel like their own characters. I barely scratched the surface during my play time. The monster AI likes to play cat and mouse with you, with a few dozen smaller enemies also seeking you down. I hope that final game improves on the camera as this will remove 90% of the negatives that I have with the game. 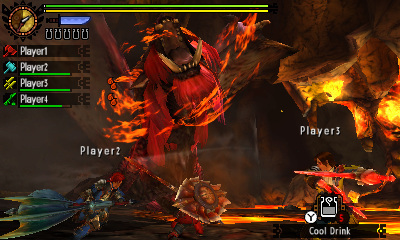 Overall, if you can get round the camera controls, I can see a lot of evenings spent playing Monster Hunter 4 Ultimate.